However, when we think of healthy, we do not usually associate it with tasty. It is not easy to stick to healthy desserts and snacks, and we usually impulsively decide to grab a high-calorie snack after all. Yet, it doesn’t have to be that way, as apparently, snacks can be incredibly delicious and healthy at the same time. 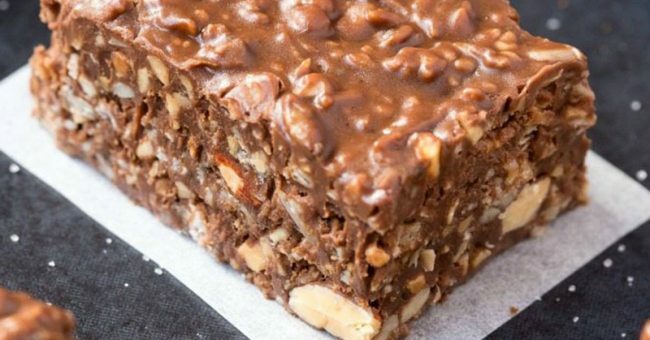 Today, we decided to share the recipe of our mouthwatering, keto-friendly chocolatey crunch bars, that contain no sugar but are rich in superfoods, seeds, and nuts. First of all, you should make the following simple homemade chocolate spread in advance. In a saucepan, over low heat, melt the ingredients, while stirring constantly. When done, set it aside at room temperature. In a saucepan or a bowl, mix the coconut oil, butter, and sweetener, and add the nuts and seeds. Mix them well, pour the melted chocolate, and mix until it is evenly coated. Next, spoon the mixture into an 8×8 baking pan, cut into 9 squares, cover tightly, and leave it in the freezer for a few hours to set. Then, when you feel like having a snack, just take a square out of the freezer half an hour in advance, and enjoy it!